Jesse Holder, a 173rd Airborne trooper, was wounded in 2007 while serving in Afghanistan by shrapnel from an RPG round. Four soldiers, four battles — and, between them — four total inches separate the slim expanse between death and life. One died because his armor plating wasn’t one inch higher. Three survived by that same tiny fraction, left to mull the unanswerable: "Why am I still here?" In the final days of 2012, the somber tally of American service members wounded in action in Afghanistan surpassed 18,000 while the number of U.S. military men and women killed there eclipsed 2,040, according to the Department of Defense. As Jesse Holder can attest, many of those 20,000-plus causalities are here — or are gone — based on a cold geometric fact of war: So often, everything comes down to a single inch. 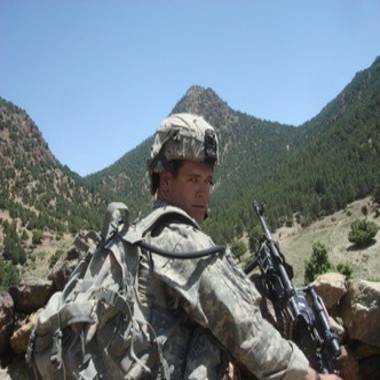 "I got hit in the neck and I thought I was done," said Holder, a 173rd Airborne trooper wounded in 2007 by shrapnel from a rocket-propelled grenade while in Afghanistan. The round detonated just above and to the right of Holder’s head as he rode in the turret of an Army truck, patrolling a steep-walled riverbed. "I said, out loud, 'Oh, this is it. I’m going to die right here.' Everybody in the truck was thinking the same thing because of all the blood." He was airlifted to a makeshift hospital where a surgeon removed the metal fragment. The doctor then revealed that if the chunk had entered Holder’s neck "one centimeter to the left," it would have opened an artery. He likely would have bled to death in the truck. Instead, he was back on the line 10 days later. He never lost consciousness. "During combat, you try not to think about it. But I think that's why, when people come back, some have a hard time," added Holder, who recently published a book, "Chutes, Beer, & Bullets," recounting some of those close calls. "I've been good at compartmentalizing it, and not thinking about it. But I lost a friend like that. It was the one inch that killed him." That buddy was Army Spc. Jacob Lowell, 22, a 173rd Airborne trooper who had been in Afghanistan for two weeks when his unit clashed with enemies armed with small arms and grenades on June 2, 2007. 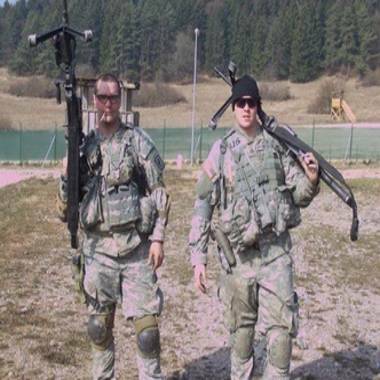 Jacob Lowell, left, is pictured with a fellow soldier. Lowell was killed in action after a bullet narrowly missed his protective armor. "All my friends, all at one time, they got wiped out," said Holder, who was not part of that mission. "A lot of our guys didn't make it home. My good friend did die by a narrow margin. The bullet went right above Jacob’s protective armor." The feeling dubbed "survivor guilt" is a sentiment that Dr. Harry Croft, a San Antonio-based psychiatrist, has often heard expressed during his conversations with more than 7,000 veterans diagnosed with Post Traumatic Stress Disorder. "I've heard lots of stories, including: 'I was so close, it could have been me.' For some, it's almost like they're saying: 'I feel worse about that than if I would have died.' So they bring home this terrible, burdensome guilt," said Croft. Recovery can be helped by "learning to reframe that event — not to forget it, but to be able to understand it in a different way," Croft said. Therapy can include coaxing veterans to talk about — and eventually accept — the notion that "in the heat of war, a lot of things happen, things you wouldn’t wish on your worst enemy," Croft said. What's more, combat includes the mathematical equation that thousands of deadly projectiles are whizzing back and forth, up and down; some hit vehicles; some hit trees or rocks or dirt; some hit people, and breeze an inch past human flesh. Former Army helicopter pilot Joe Baginski has lived more than 40 years since a Vietnam mission during which he nearly was wounded or killed so often in the span of just five minutes, he can't even calculate the number of near misses. But he's put his own survival into healthy — and folksy — perspective: "I must have been smiling just right because I never got a scratch." In November 1968, Baginski, then 21, hovered his chopper at about 75 feet in thick foliage as other men on board dropped crates of ammunition to U.S. soldiers who were running low on bullets amid a battle with a far larger North Vietnamese force. The helicopter's tail rotor spun inches from branches thick enough to bring down the craft. At the same time, North Vietnamese Army troops fired on the chopper. Bullets pierced the floor. The co-pilot was struck in the arm. A sergeant major was hit in the foot. The instrument panel and numerous gauges — directly in front of Baginksi — were obliterated in the barrage. When the ammo drop was complete, he carefully maneuvered the bird up and through the jungle canopy. "I have no idea how many rounds we had hit on the inside of that helicopter," Baginski said. "But there had to be at least a dozen that struck that instrument panel and fragments were going anywhere. I don't know how close I came but it had to be pretty close." For soldiers who beat heavy odds to survive harsh battles, finding deeper meaning in their post-military lives can help them deal with nagging wonders about why they came home when buddies did not, Croft said. "They decide: 'I guess there's a reason I'm here.' That can be the impetus to move forward with life," Croft said. That's a sentiment embraced by John Bennett, who was dropped by a sniper's bullet in Iraq in 2005. The bullet entered his right side, shattered two vertebrae, fractured a third, and cost him his colon, his spleen, half his pancreas and his ability to walk. "An inch to the left, it would have deflected off my ballistic armored plate and I would have been fine. And an inch to the right, it would have hit my liver and it would have more than likely killed me," said Bennett, a former infantry soldier who lives in Cascade, Mont. "In the earlier stages of my recovery it was a daily thought: Half inch left and I wouldn't be in this situation. And I still think about it periodically. But, I don't dwell on it," Bennett said. "I am a firm believer in everything happens for a reason. I don't know what the reason was for me to stay alive and be in this wheelchair, but it was for something. Maybe it was to help with articles like this that help others believe they can move forward, no matter what their situation is. Who knows?"